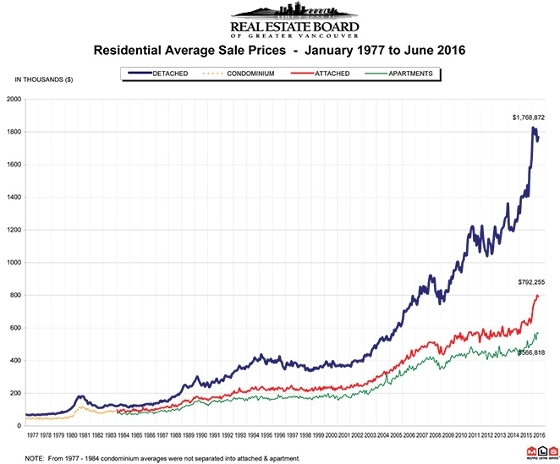 The Real Estate Board of Greater Vancouver (REBGV) reports that residential property sales in Greater Vancouver reached 2,922 on the Multiple Listing Service® (MLS®) in September 2014. This represents a 17.7 percent increase compared to the 2,483 sales in September 2013, and a 5.4 percent increase over the 2,771 sales in August 2014. New listings for detached, attached and apartment properties in Metro Vancouver* totalled 5,259 in September. This represents a 4.6 percent increase compared to the 5,030 new listings in September 2013 and a 33.5 percent increase from the 3,940 new listings in August. Last month’s new listing total was 0.4 percent above the region’s 10-year new listing average for the month. The total number of properties currently listed for sale on the MLS® system in Metro Vancouver is 14,832, an 8 per cent decline compared to September 2013 and a 0.4 percent increase compared to August 2014. The MLS® Home Price Index composite benchmark price for all residential properties in Metro Vancouver is currently $633,500. This represents a 5.3 percent increase compared to September 2013. Sales of detached properties in September 2014 reached 1,270, an increase of 24.1 percent from the 1,023 detached sales recorded in September 2013, and a 113.8 percent increase from the 594 units sold in September 2012. The benchmark price for detached properties increased 7.3 percent from September 2013 to $990,300. Sales of apartment properties reached 1,188 in September 2014, an increase of 16.7 percent compared to the 1,018 sales in September 2013, and a 75.7 percent increase compared to the 676 sales in September 2012. The benchmark price of an apartment property increased 3.3 percent from September 2013 to $378,700. Attached property sales in September 2014 totalled 464, a 5 percent increase compared to the 442 sales in September 2013, and an 88.6 percent increase over the 246 attached properties sold in September 2012. 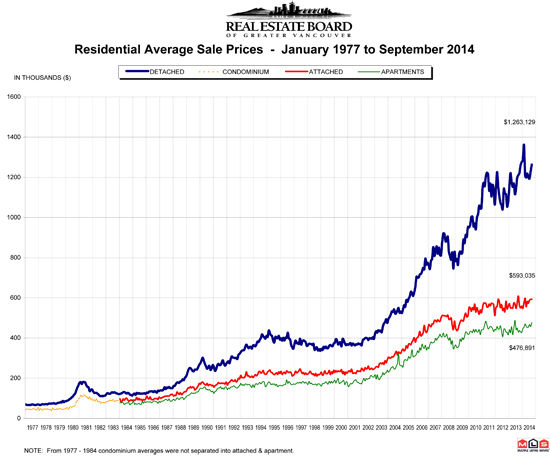 The benchmark price of an attached unit increased 4.2 percent between September 2013 and 2014 to $477,700.